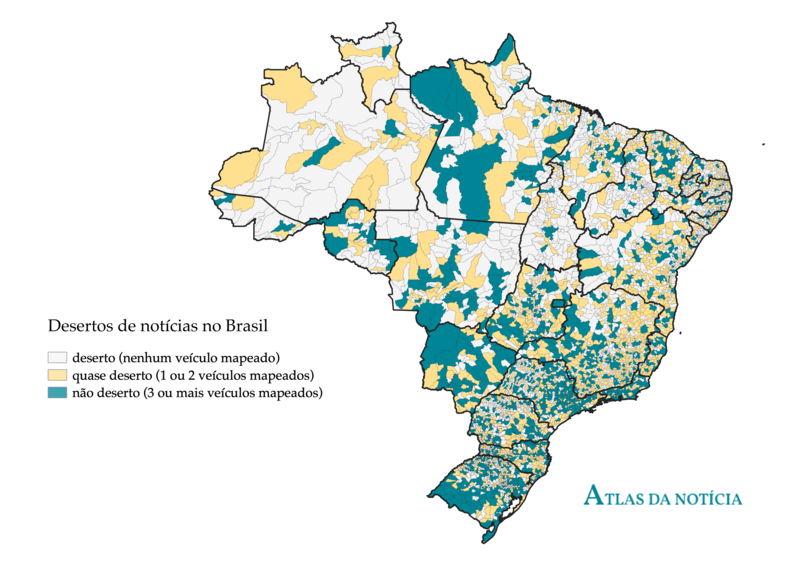 At least 30 percent of Brazilian municipalities run the risk of becoming "news deserts," areas without local news coverage. These locations, mapped by the Atlas da Notícia (News Atlas) survey, have only one or two journalistic outlets and are home to 34 million people. Added together, that makes 81 percent of cities in Brazil that are vulnerable. The picture is worrying, says Angela Pimenta, president of the Institute for the Development of Journalism (Projor), which carried out the News Atlas project. "In these places, the dependence of outlets on public authority for advertising money is greater, and there is a less widespread culture of freedom of expression," she told the Knight Center. "The public authority has no journalistic scrutiny. And the right to information, provided for in the Declaration of Human Rights, is not fulfilled." The worst scenarios are in the north (where 70 percent of cities are "deserts") and northeast (64 percent are "deserts"), especially in municipalities with lower Human Development Index (HDI). Localities without journalism outlets have an average population of 11 thousand inhabitants. Cities at risk of losing local journalistic coverage, meanwhile, have a slightly larger population average of 65,000 people. This is another point of warning, according to Sérgio Spagnuolo, founder and editor of the Volt Data Lab, a data journalism agency that developed the survey. "These 'almost deserts' are going to grab bigger cities and play in this world of news deserts. They are more developed cities, with more people, becoming deserts," he told the Knight Center. 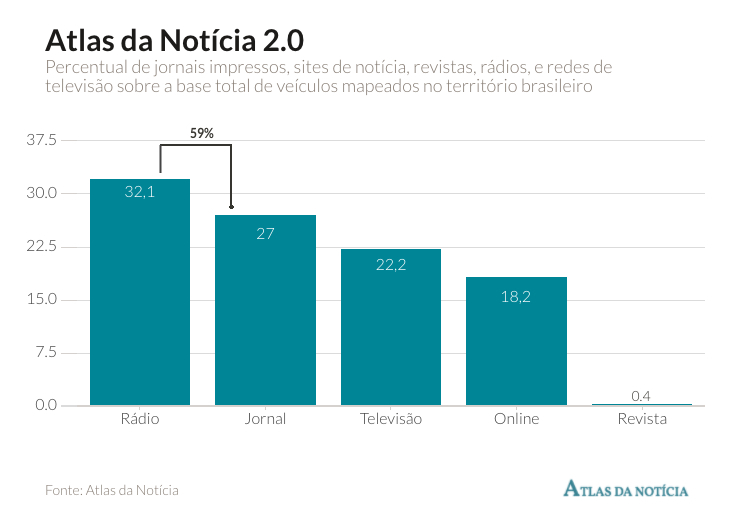 The survey also confirmed a greater reliance on coverage by radio stations and print newspapers, especially outside large urban centers such as São Paulo, Rio de Janeiro and Brasília. For the first time, the News Atlas mapped all types of press outlets and found 32.1 percent radios, 27 percent print, 22.2 percent television, 18.4 percent digital media and 0.4 percent magazines. The dependence on print journalism is even more significant when one considers that among the 81 outlets that closed in Brazil since 2011, 46 were newspapers, according to survey data. "There are two crises in this scenario: the political-economic crisis, which presses these media mainly on the issue of financing, and digital disruption," Pimenta analyzed. For Pimenta, the lack of money can also influence the quality of journalism produced, since the work of reporting requires resources. "There is a tendency to get out of reporting to produce opinion and columns. If there is not the raw material of reporting to support analysis and opinions about local life, the result is a more fragile journalism for these populations," she noted. Pimenta and Spagnuolo coordinated a network of five journalists, based in the five Brazilian regions, who had the task of updating and checking the database of press outlets provided by the federal government. These professionals recruited about 100 volunteers from universities, trade unions and press associations to fill out forms with detailed information on the media. The result was a broader and more complete database – crowdsourcing added 856 new names to the list of Brazilian outlets, 6.9 percent of the total mapped. In all, there are 12,467 media outlets in the Atlas. Data is open for public use. "We have a version (of the Atlas) that is more refined, current and precise. This number (which we obtained) is representative, we have many mapped outlets and the vast majority of Brazilian outlets appears in the survey,” Spagnuolo said. In addition to the numbers, the Atlas project also aims to show the reality of local journalism in the five Brazilian regions in special reports done by journalist Elvira Lobato and video journalist Ana Terra Athayde. The first of these is a visit to the city of Mariana, Minas Gerais, where a dam of mining company Samarco broke, leaving 19 dead and causing an unprecedented socio-environmental disaster. "Three years after the event, there is a unanimous opinion among local journalists that the national and international media only saw the first (ecological) tragedy and completely ignored the economic depression that followed the muck," Lobato writes in her report.